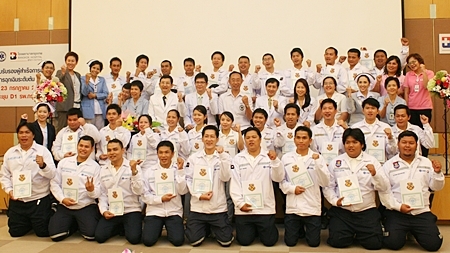 Bangkok Hospital Pattaya continues to upgrade the area’s emergency-rescue system with 33 more first responders and hospital workers training to become fully qualified paramedics. 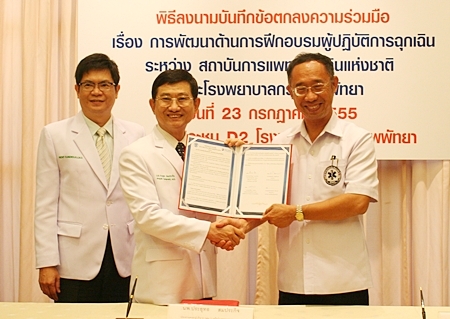 Under an agreement signed July 28 with the Emergency Medical Institute of Thailand, the hospital pledged to continue offering the Beginning Emergency Medical Technician course. As with the first course that ended in April, this month saw another 33 people certified. (L to R) Dr. Pichit Kangwolkij (hospital director), Dr. Prayuth Somprakit (chief executive of the Bangkok Hospital Group in the Eastern Region), and Secretary-general of the Emergency Medical Institute, Chatree Charoencheewakul sign the MOU. Training director Piyaporn Thippayarat said the EMT course is designed to help develop private and public medical personnel to help patients or accidents victims. BHP is one of 44 venues hosting training organized by the EMIT. Trainees underwent 110 hours of theoretical and practical training by experts in cardiac, orthopedic, pediatric and psychological emergency treatment. 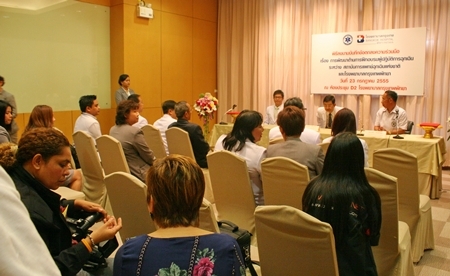 Classes were being taught at the hospital as well as Banglamung and Somdej Phrabromratchathevi Na Sriracha hospitals. 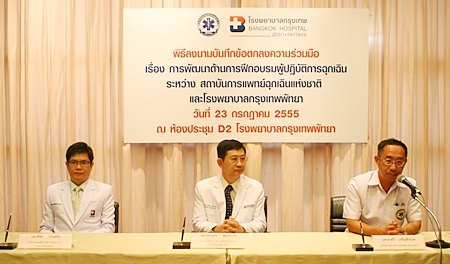 Citizens interested in participating can contact Bangkok Hospital Pattaya at 1719. All 33 successful trainees of the Emergency Medical Technician-Basic Curriculum pose for a class photo with instructors and organizers.